February is Dental Health Month!! 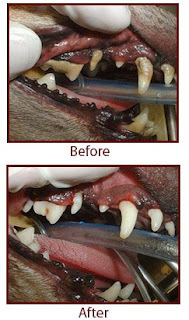 Proper dental care & prevention of dental disease is an important part of pet ownership. Symptoms of gum disease in dogs & cats include yellow & brown build-up of tartar along the gum line, inflamed gums & persistent bad breath. Call us for an exam today!! Each pet that comes in for a dental procedure during the month of February will receive a free toothbrush kit!